I post a lot of Marvel content, and so when news of Stan Lee's death hit back in November, it hit hard. 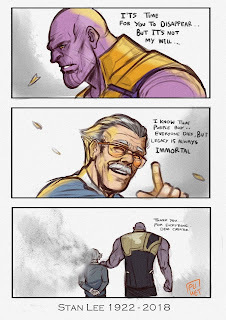 Stan Lee had created a universe that I felt comfortable in, one that made sense because, ultimately, the heroes always won, and good triumphed over evil. His stories were modern-day epics that awed and inspired. He acted as a sort of grandfatherly figure to a whole generation of people who grew up with his stories, and within days of his passing, memorials and tributes began springing up everywhere. 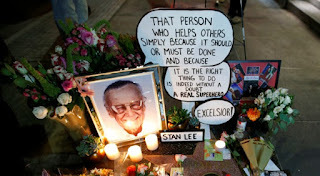 There was a central theme to most of the memorials, which was that Stan Lee left a huge and powerful legacy. As humans, aware of our own mortality, I think most of us want to be remembered. The idea of living and dying without consequence is fairly morbid; we prevent ourselves by going down that existential rabbit-hole by reassuring ourselves that our lives "matter" and that our influence stretches far beyond our limited years. This brings us to philanthropy. Although this literally translates as "love of humanity," it's understood to be the practice of donating large sums of money to charitable causes by rich people in the hope that a hospital will name a wing after you. 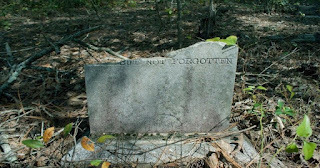 Leaving a legacy becomes easier the more money you have; while the rest of us peasants will have to be content with hum-drum gravestones that bear only our names and some dates, the monied elite can erect statues in their likenesses and stamp their names onto museums, schools, hospitals, highways, and/or parks. Jesus, who pissed in Marx's Cheerios? Griffith Park is one such example of a philanthropic park that bears the name of its generous benefactor. The original park was 3,015 acres, donated in 1896 and subsequently expanded. 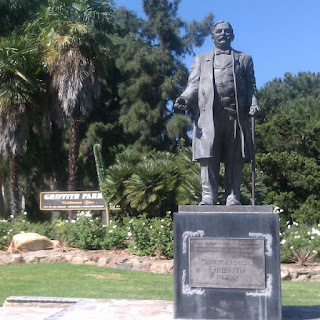 In the early 1900s, "Colonel" Griffith attempted to improve the park by installing an amphitheater and an observatory, but the city of Los Angeles refused his money, because he wasn't actually a colonel so much as he was an insane, drunken murderer. Considering his legal name was Griffith J. Griffith, you knew the guy had to be troubled. Griffith and his wife, Christina, were vacationing in Santa Monica. Griffith got drunk in the presidential suite of the Arcadia hotel and, convinced that his wife and the pope were plotting to kill him, got a revolver and shot his wife in the face as she knelt before his, pleading for mercy. His wife jumped out of the window and broke her shoulder on impact, crawling into the window of another suite below them. 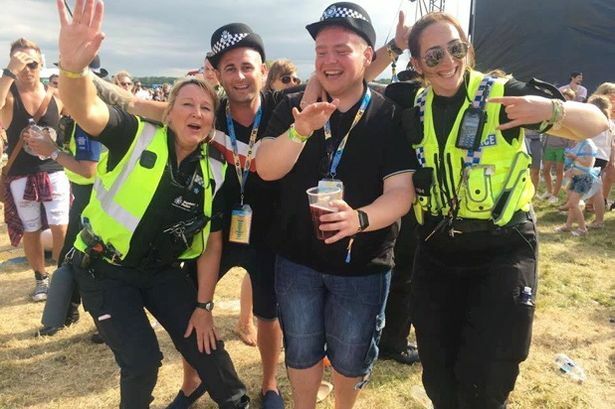 Needless to say, the police went to arrest him, and Griffith, who had initially agreed to come quietly, decided to have one last hurrah and went on a bar crawl instead, evading police for ten miles as he rushed from pub to pub getting sloshed before they finally caught him. "Okay, one more drink and then we'll finally catch this guy at the next bar." What followed was a sensational public trial, where Griffith was charged with assault with a deadly weapon. (His wife survived, though she lost her right eye and half of her face was permanently disfigured. Needless to say, they divorced.) His defense was that he suffered from "alcoholic insanity." According to writer Adela Rogers St. Johns, it was "the first alcoholic insanity defense, [and] perhaps the first... times that alcohol was called to account in an American courtroom as a disease, a mental illness, not just a sin or a crime or an indulgence." Griffith was found guilty and sentenced to two years in San Quentin prison. The judge ordered that he be given "medical aid for his condition of alcoholic insanity." It must have worked, because he emerged dry and eager to put his past behind him. Regrettably, this was easier said than done. The city had been abuzz of the gossip and it wasn't easy to forget, considering the media attention, and also the fact that his ex-wife was still blind and disfigured. "Longest possible term" for shooting your wife in the face was apparently only two years. Wanting to be remembered for something other than his "alcoholic insanity," in 1912, Griffith offered Los Angeles $100,000 to build an observatory atop Mt. Hollywood. The city balked because they "didn't want it to be a monument to a disgraced man." Undeterred, Griffith offered the city $50,000 the following year for a Greek theater. Again, they turned the money down. Griffith died in 1919 of liver failure, probably due to his drinking. 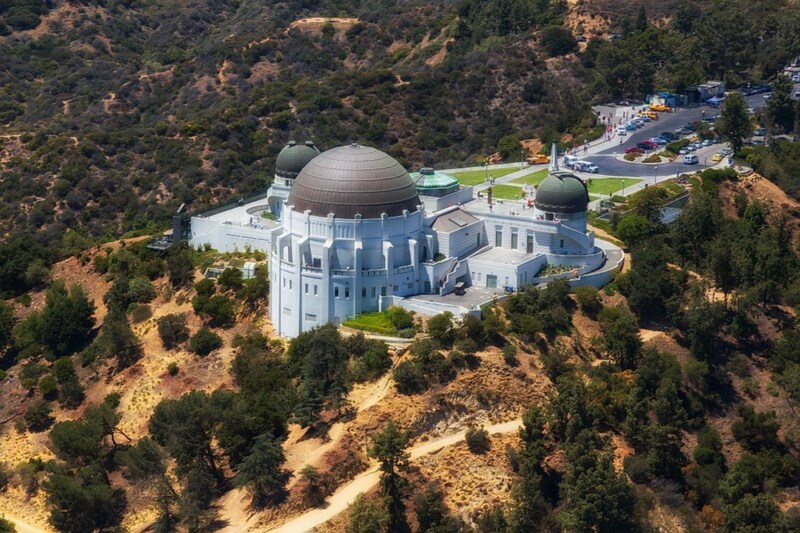 He set up a trust fund for his two projects and the city reluctantly accepted his money, building Griffith Observatory in 1935 and the Greek Theater in 1930. Griffith left a complicated legacy. His crime is widely known to this day, though his park, theater, and observatory are enjoyed by the public and bear his name. Ultimately, he did accomplish his goal of making Los Angeles a "happy, cleaner, and finer city." People associate him with his park and not so much with his drinking or his (apparently terrible) personality; people of his time described him as "flashy," "pompous," and a "midget egomaniac [with] an exaggerated strut like a turkey gobbler," not things you'd necessarily glean from the statue of him that stands outside his park. And the portrait of Griffith hung up in the observatory proudly gives him his "Colonel" title despite zero evidence he ever earned it. But my question is, despite leaving the legacy he more or less wanted... does it matter? Legacies matter only to the living. Once we're dead,we can no longer enjoy them. Griffith envisioned an observatory and a theater, but he never got to see the fruits of his labor. 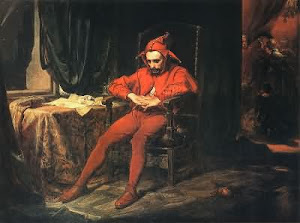 In his own time, he was a pariah; among his contemporaries, he was not well-liked, and the general public opinion of him wavered between "violent madman" and "foolish baboon." Griffith died alone with only the comfort of what might have been; he never got to see his statue, or any of his projects come to fruition. I submit, therefore, that we should fight not for our reputations after we die, but for our reputations as we live. Both G.J. Griffith and Stan Lee left us behind wonderful monuments that we, the living, can enjoy. But while they lived, one of them was beloved and one of them was not. Who enjoyed their life more? Undoubtedly Stan. He got to bask in his legacy as a good person before he died. Griffith, on the other hand, threw money at his problem in the hope that generations down the line, no one would think of him as an insane alcoholic. It's good to try to leave something for the betterment of future generations, of course, but it shouldn't be done for reputation repair; by the time such a legacy is created, its owner is long dead and unable to enjoy the fruits of that legacy. Legacies are not for the people who leave them, but for others who those legacy-leavers will never get to meet. 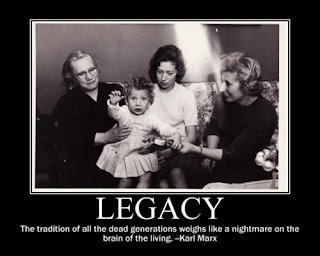 We "leave" legacies, because guess what? Once we die, that's it. We don't get to take the legacy with us. What we do with our time on this earth is all we really get and everything that happens on earth after we die is of no consequence to us whatsoever. Sorry, folks, but when our time's up, that's it. So why leave a legacy at all? Arguably, they should be left for purely philanthropic reasons: for the literal "love of humanity." Something that Griffith J. Griffith, a so-called philanthropist, never got to enjoy during his time on this earth.